And also the 7 characteristics every successful entrepreneur must possess before they even start a business and how best to start any business. If you'd like to start a business that gives you the freedom to live your dreams without worrying about money or being concerned about your boss, this will be the most important book you'll ever read. I often meet people who really want to start a business but do not know what business to start as they have never been in business before or have tried and failed at a number of businesses. Interestingly, I noticed that most of the people who ask me this question already had a paying job. ...a job can never make you wealthy! Plus, you can be sacked at any time. After helping hundreds of people decide which business to start, I decided to put the fool proof strategies you can use to identify what business you can start in a book so that more people can have access to it. First of all, here’s what you need to know… this book isn’t like the regular business books out there. I’ve eliminated all the unnecessary details and share only practical strategies that you can use right away to quickly determine what business you should start. The book is only 49 pages so you can read it in one sitting… How easy is that? 7 Characteristics that will help you and your business stand the test of time. Page 3. 7 must have traits if you want to succeed in business… Without these characteristics, don't even bother! Page 3. 24 Practical questions to help you decide if starting a business for you and what you can do immediately… this will save you headaches! Page 3 - 16. The one business advice that will save you the risk of losing your entire life savings, heartaches and many sleepless nights… ignore this to your own peril. If there's one word I could use to describe Temi Ashabi, it'd be DISSATISFIED She's absolutely dissatisfied with the status quo...it's the dissatisfaction from seeing so many women with more questions than answers that has birthed this incredible book, "What Business Do I Start"? In this book, Temi doesn't tell you what business to start as much as she does get you to answer the tough questions that require the answers you really need. If you're dissatisfied, then this is the book for you. Don't start a business now or sometime in future without first reading this book. I call it the pocket size business start-up bible that every new or aspiring entrepreneur needs. 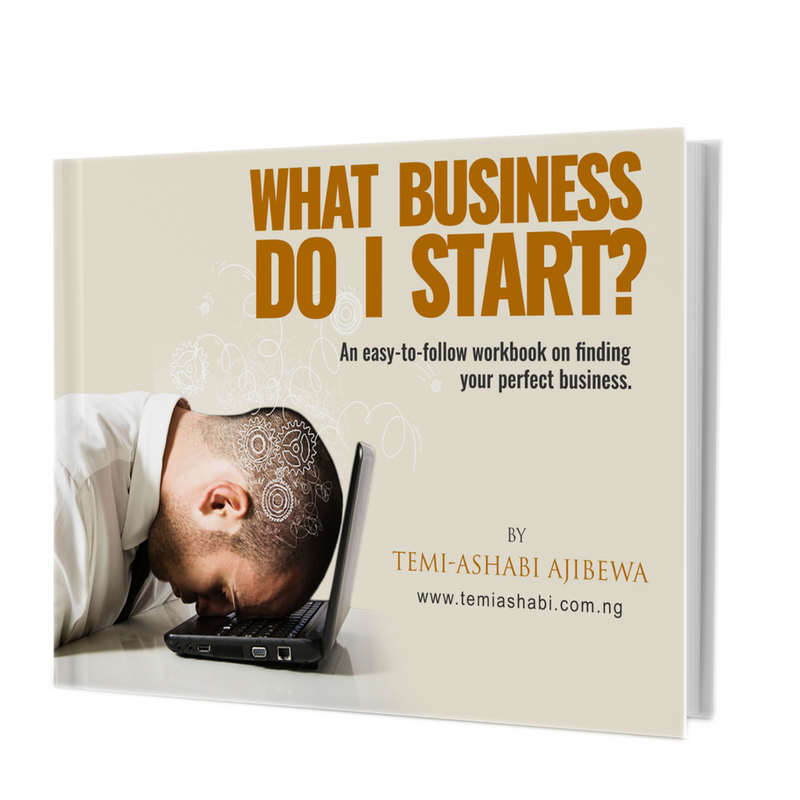 Temi has put together in this book the checks and balances in form of simple questions that can help you ascertain whether you are ready to start your business now or never. ...on digesting the book, I could see how her experience with running businesses came to bear. I especially like the evaluation sheets at the end of the chapters, to get people to think about the opportunities that lie around them. The book was easy to follow, concise and to the point. I recommend it for anybody starting out on their own. After payment, send an email containing your name, phone number and email address to temiashabiglobal@gmail.com with the title 'What Business Do I Start?'. Simply click on any of the buttons below to make your online payment and you will be directed to a page where you will enter your Card details to make payment and upon success, you will be redirected to the book for download. As soon as your payment is confirmed, you'll get an automated receipt and you will be redirected to the ebook where you can download and view it. I believe this book will add tremendous value to you that I’m taking all the risk. If you don't like the book let me know and I'll gladly give you back your money. You don't even need to send the book back. Send me a message to temiashabiglobal@gmail.com and I’ll gladly help you out. PS: If you’re still hesitant, no problem. I plan to be in business for a long time so I’ll still be here. The only problem is that you’re not getting younger so why procrastinate on your dreams? I'm glad I read this book. It opened my eyes to little details I never would have known. I gladly recommend to anyone who needs answers to questions bordering on what business to start or if they should even start. Through this book, I have seen that am lacking in some of the needed skills that makes a successful entrepreneur. I need to work on my sense of judgement and on my implementation speed. I recommend this book to everyone who desires to become an entrepreneur now or in the nearest future. If you apply the knowledge gained from this book, you will sure last through thick and thin.